Airtel is looking to partner with device makers in India to offer low-cost EMI plans under a so-called Project Next initiative. The first brand to come on board is Nokia, as Airtel has tied-up with HMD Global to offer attractive financing schemes for the Nokia 6 (2018), Nokia 7 Plus and the flagship Nokia 8 Sirocco. With a down payment of Rs 3,799, you can get a 2018 Nokia smartphone with EMI plans starting at Rs. 1,499 for the Nokia 6 (2018). The EMI costs includes your Airtel mobile subscription – i.e bundled voice and data plan, with unlimited voice calls, free Airtel TV subscription and 30GB of data per billing cycle, with remaining data carried forward to the next month’s billing cycle. Airtel’s plan is not unlike buying a phone from the carrier in the US. You will have to pay a down payment fee and subsequent payments are in the form of monthly Airtel bills. This is, of course, not the first time that Indian mobile providers are offering such schemes to break payments into monthly postpaid plans. 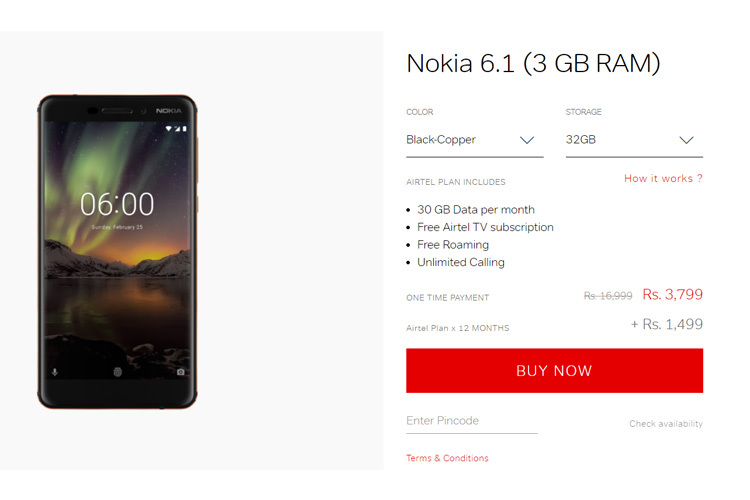 Usually, it’s preferred for premium smartphones such as iPhones or Galaxy S flagship series thanks to their high prices, so Airtel deciding to do the same for Nokia mid-rangers is interesting to say the least. “We are pleased to introduce Nokia’s smartphone range on our digital platform and add to the range of smartphones available to customers”, Bharti Airtel’s Chief Marketing Officer, Vani Venkatesh was quoted as saying by the Economic Times.